Miami has long been the place to be, for hot, wild entertainment, with a latin flair and style. Now Miami can add exciting cruise to Bimini, Bahamas, as part of it’s fun. 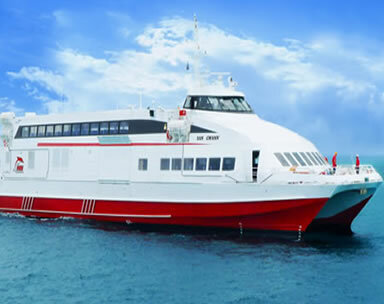 Friday, Saturday and Sunday you can hop aboard the cruise ship to go on a 1 day cruise to Bimini, Bahamas. Start your fun filled day very early in the AM, you need to be at Cruise Port of Miami by 7:30 AM, don’t be late, you won’t want to miss this super valued mini 1 day getaway to the Bahamas. Bimini, Bahamas, is; warm, quiet, blue, green, sandy white, full of sea life, awaiting your pleasure, ready to please, full of sun and smiling faces, populated with wildlife and fishing boats. That hammock, hanging between the trees, longs for the body it will cradle. That frozen concoction will swing with you and the cradling hammock. The blue green, crystal clear, water has to wait until you have finished your frozen drink and you’re to warm to stay out of the water, any longer. Casino complete with table gambling not offered in Florida land casinos. Try your luck on some generous slot machines, shoot the craps, or take a spin on the wheel of roulette either way you spin the dice or roll the wheel, excitement is your winning hand. On the day you are going to take your 2 night Bahamas cruise to Freeport, Bahamas, you and your family, can't help but feel excited about the adventure that awaits you in the tropics. Don’t forget the sunblock, snorkeling gear, and beach towels. The day on the island will be filled with sun, smooth white sand, and warm blue green crystal clear water and plenty of tropical island food. 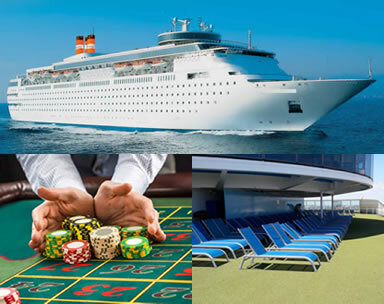 It is the only cruise that has a option to stay in some of the resorts in Grand Bahama Island, Bahamas, with 4 or 6 Night Cruise to Stay™ Resort Packages. This boat has everything you need top get to Freeport Grand Bahama Island, Bahamas, enjoy your 7 or so hours on the island and get back home all in one day, so you can be back to work the next day. Ticketing and Boarding begin at 7:00 a.m.
Last Call to board 8:00 a.m.
Departs from Fort Myers 8:30 a.m. 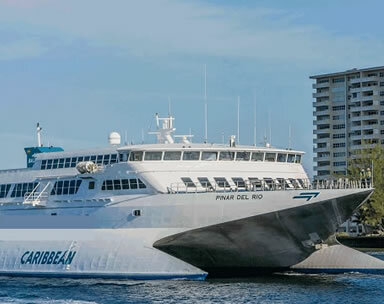 Approximate Key West arrival time 12 P.M.
Key West Boarding begin at 5:00 P.M.
Key West Last Call to board 5:30 P.M.
Departs Key West 6:00 P.M. Approximate Fort Myers arrival time 9:30 P.M.
Time of travel from port to port is approximately 3.5 hours each direction. Weather & marine conditions may influence duration of travel. You may carry on two small pieces of luggage for free. If you can carry it on an airplane you can carry it on our ship.